Use a torx bit to remove the face plate of your tweeter. Take out the old voice coil assembly and pop in the new one. Screw the face plate back on. If you have one of the metal domes, like the D25AG05-06 or the D25AG35-06, you could use this dome but the diffuser on your tweeter will roll off the highs. Consider clipping the diffusor off. If you prefer a metal dome, the Seas 27TBFC/G is an excellent replacement and considered an upgrade. The face plate and screw holes are the same, and it will fit the through hole in your cabinet. You will just have to make a notch for the 180 degree speaker wire tabs, compared to the 90 degree on the Vifa. 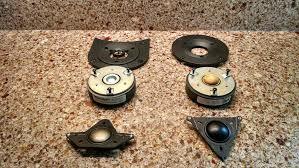 This voice coil has been used to repair many Paradigm metal and soft dome tweeters. If you take your metal dome tweeter apart, the voice coil assembly looks a little different, but the 600058 voice coil will fit in its place. See picture below. If you have a metal dome tweeter and replace it with this soft dome voice coil, consider clipping off the protective cover the original metal dome had for optimal performance. An alternative to this is buying a complete D2606/9200 tweeter, removing the round face plate, and mounting your original face plate to the new tweeter. 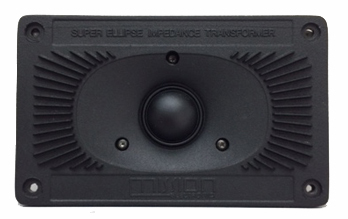 This voice coil can be used in the Mission® R76/78-HFU-D26 tweeter.